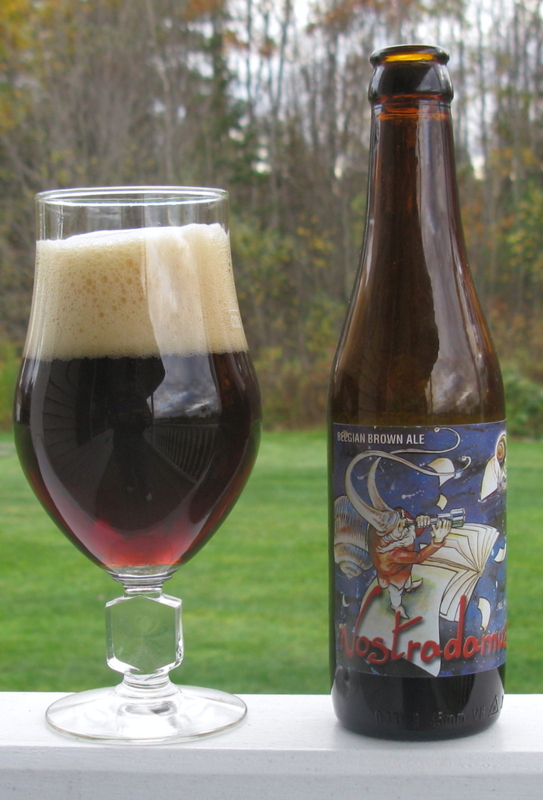 Nostradamus is a brown ale from southern Belgium, very near the French border. Brewed by Brasserie Caracole, this beer has a reputation of being one of the better strong, dark ales out of Belgium. Clocking in at 9.0% ABV, this is a beer I am very happy to see in the smaller bottles. Appearance — beer pours a dark brown with red highlights when held to the light. Nice head that collapses with with lacing, leaving a 1/4 inch film of carbonation on the top. Aroma — Dates, burnt sugar, chocolate, and an almost cotton candy smell on the back. You can smell some alcohol. There is also a spiciness, like just a touch of nutmeg. Taste — Malty at first, quickly moving to the date/plum fruit esters, and then a bit of dark toffee. There is then a bit of spice to the beer, that works well with a very nice bitterness at the back that helps to clear the tongue, it finishes dry. Critique — I like it. The aroma is kinda odd, not bad, just not exactly what I was expecting. The taste is very nice. I expect lots of caramel and dark fruit flavors from a dark Belgian ale, and I get that, but what I really can’t get over is the medium body at 9%, the lack of hot alcohol on the tongue. This is devilishly easy to drink. It is not overly sweet up front, and it finishes quite dry actually. I think this is a great example of how a good Belgian beer masks that 9% boot to the head. This is a style that can get very thick and cloying, but this beer shows you how you can really nail it, while still making it very drinkable. Great beer to try if you are planning on brewing something in this style. As a homebrewer, I really appreciate the craft that went into making this beer.